I do apologise for the long absence on the blog, but I have just emerged from a long and hard battle with a cat. Yes, a cat has been destroying my daily happiness for many weeks, after it discovered my door step was perfect to act as its new cat litter. For the past two months, my daily routine consisted of stepping in said cat’s poo, shouting to the gods about the lack of injustice in the world, clearing it up and then spending 20 minutes scraping off the remnants from my shoe. This cat was good; it learnt to do its business in different places so I could often smell it and not see it, which resulted in me scrambling in the hedge – needless to say my neighbours think I’ve lost it. And so, the battle commenced! ‘Cat OFF’, everyone declared, a simple powder you spray around the offending area, was sure to ward off this devil of an animal. Well, after spending £10 on this ‘miracle cure’ I poured the entire contents outside only to find that the next day, the cat had had the audacity to dump ON the pile of powder. ‘Fox OFF’, ‘Animal OFF’ – all were used but the cat LOVED it and even seemed to be upping its anti… I eventually resorted to writing to an specific pet Agony Aunt: they too were mystified as to what I could do. My father, his army brain clearly enlivened by my dilemma, was sending me battlefield advice and even sent me a link to what only can be described as Gulag-like battle enforcements (spiky and terrifying – I declined, fearing the RSPCA would lynch me). Luckily, my mother stepped in: ‘Buy a fake snake’ was her golden advice. I was dubious but desperate, so purchased a £1.99 plastic snake who I’ve fondly called Sammy. Well, Sammy is working his magic, the cat is clearly terrified and has yet to darken my doorstep again. It’s been two blissful weeks of cat poo freedom. The other day, as I was bounding down the street with joy, I saw the cat… crapping in my next door neighbour’s patch. I decided to scuttle onwards feeling a mixture of guilt and jubilation. Trying to earn my place back in heaven for my cat misdemeanours, the cake below was made for a Christening. 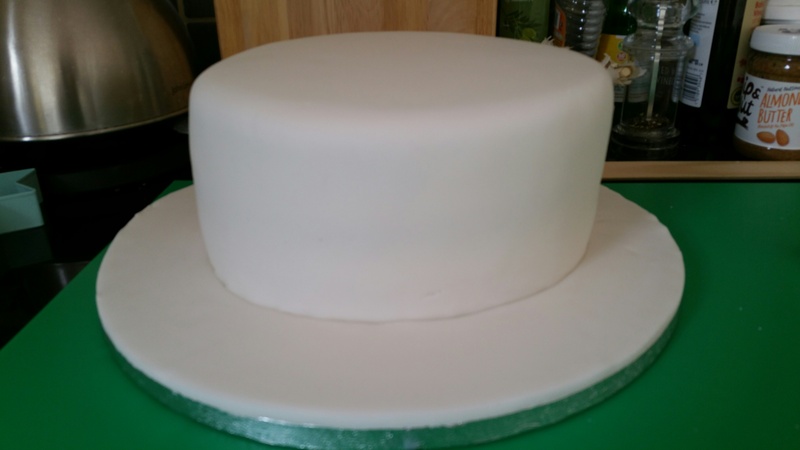 It’s pretty adaptable – you can change the colour icing to make it suitable for a range of events. 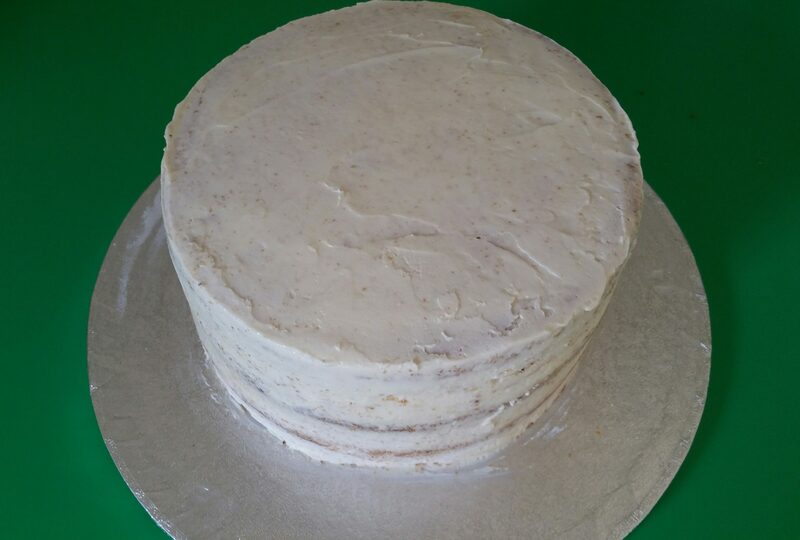 The Crumb: A thin coating of buttercream, before covering with fondant icing. The Fondant Stage: Once completely covered in fondant, you can start decorating. Flower Power – Drying out. The longer you’re able to let them harden the easier it’ll be to insert them into the cake. Grease and line 3 20cm circular baking tins. Put all the cake ingredients into a large bowl and mix really well until it forms a thick batter. If it’s too thick, add a couple of tablespoons of water to loosen the mix. Pour evenly into your 3 cake tins. Bake for 25 minutes or until the cake is lightly golden and a skewer comes out clean. 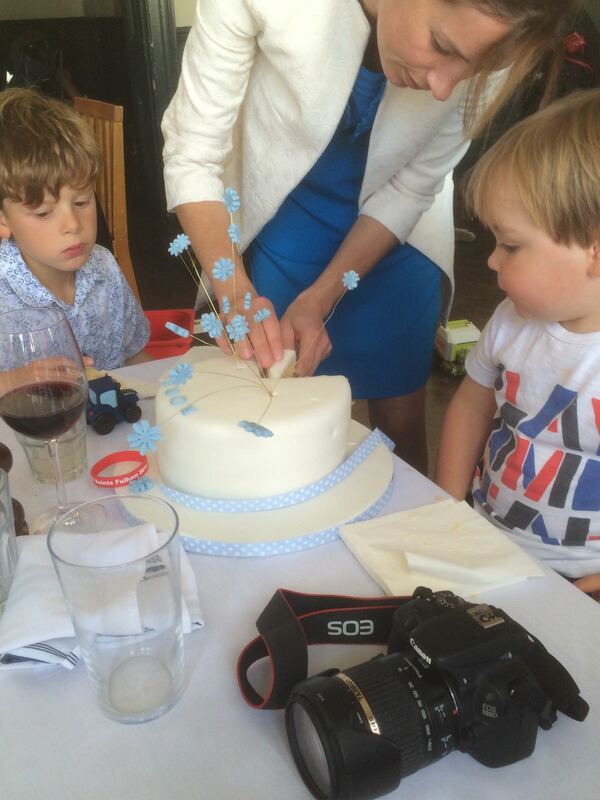 Beady Eyes overseeing the cake cutting…. Make the buttercream by beating all the ingredients, excluding the jam, together (ideally mix on a high speed for 5 minutes so it’s really smooth and a good spreadable consistency). Remove the greaseproof paper from all 3 cakes and trim the tops of each cake so they are completely flat. Spread a little buttercream on a circular presentation board and place one sponge in the centre. Next spread a thin layer of buttercream on top of the sponge, followed by the jam. Repeat this step with the second sponge. Place the third sponge on top. Now, you want to ‘crumb’ the cake, which means you want a thin layer of buttercream around the whole cake before you put the fondant icing on. A tip: the less buttercream the easier it is to work with. 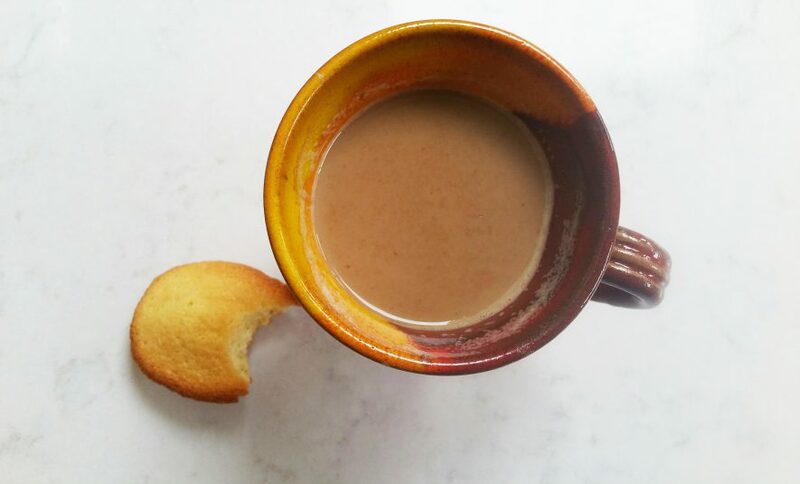 You don’t want a thick layer; ideally you want to see the sponge beneath it (see picture). Once covered, place in the fridge for 40 minutes. Whilst the cake is firming up in the fridge, make the flowers. Roll a thin layer of blue icing and, using a patterned stamp of your choice, cut out the shapes. It looks better if you use a stamp of various sizes. I used a flower cutter which came in 3 different sizes. There are 2 ways of inserting the floristry wire. Either take one stamped flower and dap some edible glue into the centre of the flower, then place the wire on the glued part. Place another identical flower on top and gently press to seal. 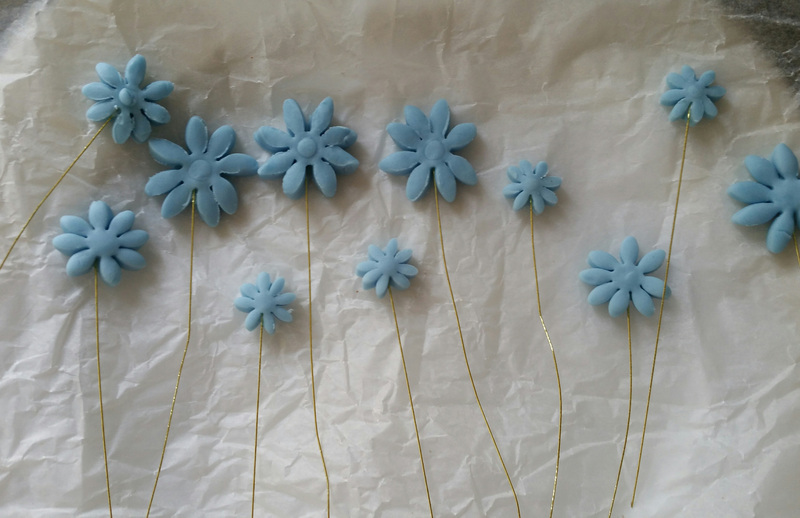 OR, you can roll the fondant slightly thicker, cut out the shape, and place a small amount of glue at the end of the wire before inserting into the flower. I experimented with both methods and they worked equally well. Repeat until you have about 12-18 flowers. Ideally you want to leave these to dry for as long as possible before inserting into the cake. Roll out the white fondant, take the cake out of the fridge, and cover the cake completely with icing. If you wanted to add lettering do and secure with glue. Once the fondant flowers are hardened, tie the floristry wires together using Semtex tape. I did two separate bunches, of about 6 flowers in each. 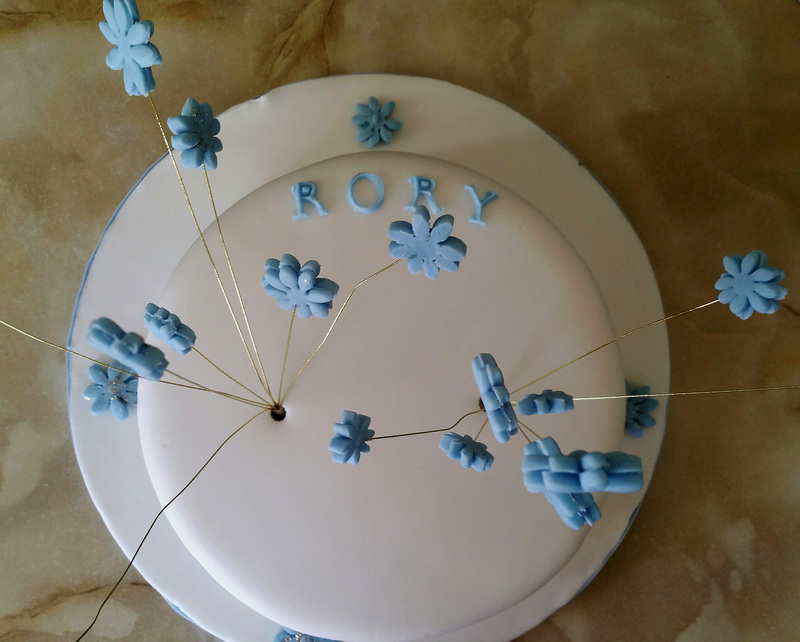 Place each bunch into one posy pick and insert into the cake. Decorate with your choice of ribbon around the presentation board. Directions for use: If you have a cat problem, please drop me a line and I will listen with empathy over the trials and tribulations of these 4 legged ‘friends’.